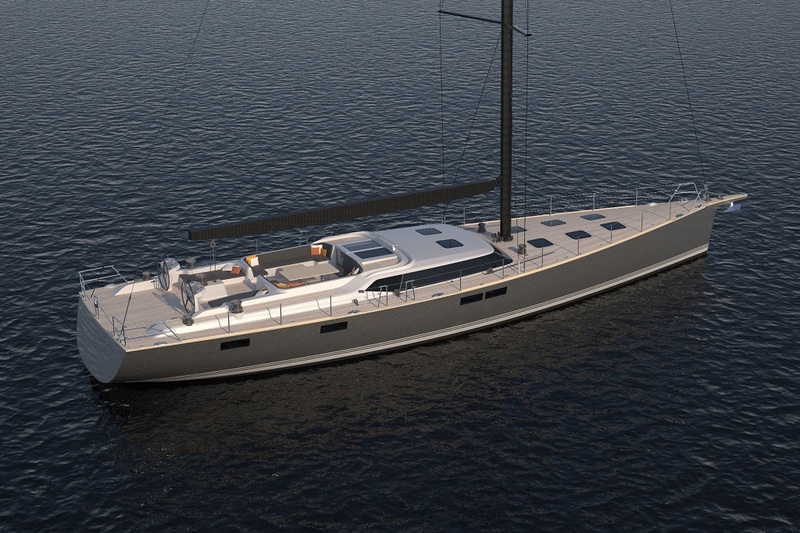 Contest Yachts announce launch of first new flagship 26-metre Contest 85CS just weeks away. Launching in September, Contest 85CS will be the largest of all Contest Yachts to date. This new build is commissioned for a world circumnavigation by an owner with very particular views on safety systems, deck layout and interior arrangements after significant deep ocean experience. In collaboration with Judel/Vrolijk, the Contest team has used structural techniques and infusion moulding processes, achieving great strength for light weight and enhanced performance and handling. Contributing to this, the entire hull moulding from keel to rail has a foam instead of balsa core and in the interior lightweight foam-cored joinery in this special commission. While the Contest team and interior designer Wetzels Brown have created five primary accommodation plans, on Contest 85CS #1 the design revolves around three suites with galley aft and vast, functional crew quarters forward which include a second, dedicated navigation centre and office plus full workshop and enormous walk-through sail and rope locker, as the entire, extensive sail wardrobe is to be carried complete on board at all times. To be crewed generally just by two, sail handling systems have been designed for single-handing. As with all equipment and systems on board, all aspects of the rig can be handled manually should there be any machinery failure. The latest Contest 85CS design. This practicality extends throughout the accommodation which still luxuriously serves voyage-makers well with ease of access to all workings without disruption, exceptional stowage with to-hand-integration of emergency and life-saving equipment. Keeping the efficient, highly functional galley supplied with mountains of fresh fruit and veg coming aboard, there’s vented storage in the lazarette which, of course, also houses the more typical fare of tender, diving gear and compressor. This new Contest 85CS caters for everything. With such well-practised collaboration as this between Contest Yachts, Judel/Vrolijk & Co, Germany’s leading naval architects, and eminent Dutch interior designers Wetzels Brown Partners, the Contest 85CS shows so well the best of contemporary seagoing design, optimised from keel foot to masthead, outside and in. Together this delivers the perfect balance of performance bluewater cruising and optimum safety in ocean crossing, tailored to the individual owner’s exact intentions and taste.